“My daughter would not have died if there had been a road diet on Monroe.” Those were the sobering words from the father of Alexa Hyneman, the Grady student who was killed in February 2016 when she was struck by a car on Monroe while riding her bike home from Grady, at the February 28th Renew Atlanta Meeting on the Monroe Complete Streets Project. Alexa’s father explained to the more than 300 people in attendance at the meeting that Alexa was struck by a car that was changing lanes to avoid the left turn queue – a maneuver that would not have occurred if there had been a dedicated left turn lane as called for by the road diet. Incredibly, the latest fatality on Monroe – one that happened this past January, less than a year after Alexa’s death, occurred under very similar circumstances. The victim, who was riding on a motor cycle, was reportedly stuck by a car that was changing lanes to avoid the left turn queue at Monroe and Park. As with Alexa’s death, this death would not have occurred if the road diet, with its dedicated turn lane, were in place. It is irrefutable that road diets make roads safer by reducing speeding, eliminating lane jockeying to avoid the left turn queue, and eliminating the left turn blind spot that is caused when left turning cars must cross two lanes of traffic instead of one. Renew Atlanta confirmed this and showed that a road diet on Monroe would reduce crashes by 29% and, in conjunction with the proposed traffic circle at Park and Monroe, would lead to a 60% reduction in injury crashes at that intersection. In addition to the dramatic safety improvements, however, the Renew Atlanta team indicated that under current conditions, a road diet on Monroe could lead to moderate increases in am peak north bound travel time and significant increases (up to 140%) in pm peak travel time. (The number provided at the meeting was an increase of up to 140% in 2026, a number that is presumably based on 2026 traffic levels, which are nearly impossible to predict in 2017). But even after presenting this increase in travel time, the 300+ attendees at the meeting still overwhelming supported the road diet, with almost 70% voting “yes” for the road diet during the instant online polling conducted during the meeting. No one wants to have increased travel times on Monroe, but it is important to put this into perspective. Peak am and pm travel times will impact 12% of the time while the benefits of the dramatic safety improvements from the road diet will cover 100% of the time. Although the majority of people at the Renew Atlanta meeting support the Road Diet, and a road diet is called for in the Virginia-Highland Master Plan and Beltline Subarea 6 plan, there are still those who oppose the road diet. Rather than opposing the road diet, however, people who are skeptical or even opposed should focus on how to make it a success. One of the most dramatic ways to reduce vehicular traffic on Monroe is to convert Piedmont from one way between 14th and Ponce (or even just 14th to 10th) to two way. Having a second north/south route from Piedmont to Ponce (or 10th) will give commuters who now use Monroe another – and better – option for their north/south Commute. There are other tools as well. For example, with the realignment of the bike lane proposed for 10th and Monroe, there can be a dedicated right turn arrow from southbound Monroe to westbound 10th when there is the dedicated left turn arrow from westbound 10th to northbound Monroe. And for those who are concerned about cut-through traffic and speeding on side streets, there are tools to help with those issues as well. The Virginia-Highland Civic Association is committed to lobbying for all of these necessary changes and working to find other improvements as well. There are also significant changes happening between now and 2026 that will also reduce traffic on Monroe. By 2026, there will be transit on the BeltLine, and MARTA will have implemented its enhanced bus service, including its proposed service for smaller buses that will serve shorter, residential routes. These significant improvements to transit will undoubtedly reduce the number of cars on Monroe and make an estimate for 2026 based on current conditions and a road diet rather meaningless. Now is the time for action. We must show the Renew Atlanta team that we support the road diet. You can voice your support for the road diet and submit additional comments on the Complete Streets project via email to: renewatlanta@atlantaga.gov The attached comment card, which was distributed at the 2/28 meeting, can also be sent in via email. Comments must be submitted by March 15, 2017. A final caveat – Although the road diet is certainly the most critical piece of the Complete Streets project, the project proposes other street improvements as well, including intersection improvements to 10th and Monroe, a realignment of Virginia and Monroe, a proposed traffic circle or alternative intersection improvement at Park and Monroe, and other modest intersection improvements. All of the proposed street improvements are online on the Renew Atlanta website (click here). Additional changes, such as improved lighting and landscaping and light synchronization, will also be part of the Complete Streets project. Those passionate about transportation improvements in the city of Atlanta have experienced a roller coaster of emotions over the past few years. As a review of the list of projects included in the city’s upcoming proposed infrastructure bond reveals, we all now have something to look forward to. The city of Atlanta is currently conducting a third and final round of public meetings for the upcoming Renew Atlanta 2015 Infrastructure Bond. Representing the city at a January 13 meeting were Public Works Program Management Officer Rodney Givens; Billy Warren, Director of Facilities Management in the Office of Enterprise Assets Management and ADA Coordinator; Chief Real Estate Officer for the Mayor Jalal Slade; Commissioner of Public Works Richard Mendoza; Katrina Taylor Parks, Deputy Chief of Staff for the Mayor’s Office; and Charletta Wilson Jacks, Director of the Office of Planning. All will play an important role in the implementation of projects included in the bond. Monroe Drive at Park: Replacement of traffic signal LED’s, cabinet, controller monitor, signal wiring, communications, & timing at the intersection. Monroe Drive at Amsterdam: Replacement of traffic signal LED’s, cabinet, controller monitor, signal wiring, communications, & timing at the intersection. Barnett Street at Saint Charles Ave: Replacement of traffic signal LED’s, cabinet, controller monitor, signal wiring, communications, & timing at the intersection. These projects represent only the tip of the iceberg of what would be improved with bond funding. Other inspiring projects include a number of streets to be converted to “Complete Streets” (more on that below), a citywide traffic signal upgrade, numerous road resurfacings, and school flashers for SPARK, Morningside Elementary and many other schools. A full list of proposed projects can be found on the city’s website. The site features a useful interactive map where you can make comments. “Complete Street” projects would significantly improve existing transportation corridors. The term refers to a set of policy and design principles adopted nationwide in communities looking to improve the variety and safety of their transportation options. In the words of Smart Growth America, Complete Streets “are designed and operated to enable safe access for all users, including pedestrians, bicyclists, motorists and transit riders of all ages and abilities.” (See link below.) This can include bike lanes, sidewalks, rapid transit lanes, or any number of comprehensive transportation infrastructure improvements. With this range of improvement recommendations, each specific Complete Street project must be customized for the unique street where the policy is applied. In our case, we’re talking Monroe Drive. Virginia-Highland’s Master Plan reiterated the need and consensus for improvements on Monroe Drive. With a fatal accident happening yet again last weekend, the call for improvements on Monroe has never been louder. The Master Plan recommendations, however, are much more specific than what is called for in the infrastructure bond. Those recommendations include support for the road diet recommended by Connect Atlanta and, additionally, a traffic circle at Park Drive. However, that may not at all be what the city ultimately implements. Before any improvements are made, a traffic study and further design will ultimately shape and determine the appropriate improvements to be made. At the end of the day, VHCA fully supports any improvement for safety on Monroe. It simply cannot happen soon enough. Within resurfacing projects, there is an opportunity for increasing Atlanta’s bike infrastructure as well. If a bike lane, cycle track, or sharrow path has been called for in a previously adopted plan, whether it be the Comprehensive Development Plan (CDP) itself or additions like the Connect Atlanta Plan or VaHi’s Master Plan, then bike infrastructure will be engineered into the project. This is a key element in making Atlanta a more healthy, sustainable and desirable place to live, especially as we compete globally with other cities for jobs and housing growth. Not to mention, having separate infrastructure for cyclists makes travel safer and smoother for everyone. VHCA will follow the resurfacing project proposed for Barnett Street and publicize any developments as they come available. The Master Plan made a handful of recommendations for improvements on Barnett Street and we would like to coordinate with the city and neighbors to see those improvements implemented. If the infrastructure bond is approved by voters in the upcoming election, the city expects to begin work on projects as soon as funding is available on or shortly after July 1, 2015. Similar to the Quality of Life bond projects undertaken more than a decade ago, working through the full list of projects included in this bond referendum is likely to take about five years. 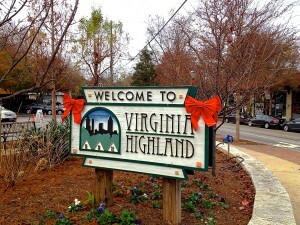 What can you do to support improvements in Virginia-Highland and throughout the city? Vote for the bond on March 17th. If you aren’t registered to vote, you can do so on this website. In the meantime, you can always submit regular maintenance and repair requests to the city’s new 311 system. Call 311 anytime or visit http://www.atl311.com/. For sidewalks, don’t forget that at this time citizens are ultimately responsible for sidewalk repairs to their adjacent property. This applies to both residential and commercial property owners. If the damage has been caused by a tree root in the city’s right of way, then the City is responsible and you should reach out to them for repairs. The topic of sidewalks in Atlanta is an entirely different can of worms and anyone interested in what the city is doing to improve sidewalks should closely follow the legislation proposed by city council representative Mary Norwood and eight of her peers. VHCA is also very interested in this topic and would be happy to discuss it with anyone interested. For more information on Complete Streets, visit Smart Growth America’s website. Click here to view the complete Virginia-Highland Master Plan. As we raised our glasses this New Year’s Eve, we paused to remember – with appreciation and gratitude – the many contributions of neighbors and volunteers during 2013-2014 on the Virginia-Highland Master Plan, which is now an official part of the City of Atlanta’s Comprehensive Development Plan. As important as its adoption was the process that created it and its rich content. Close to 100 projects were recommended for our neighborhood. Now that we’ve had a chance to catch our breath, we’re ready to dive into the hard part: implementation. The VHCA Planning and Master Plan Steering committees have been reviewing the recommended action items, identifying the processes and agencies that can move them forward. The projects can be distinguished in several ways. Some are dependent on City of Atlanta funding initiatives (a broad topic now on the table at City Hall); some are longer range and process-intensive and will take a while to come to fruition. Some projects are already underway or can be initiated here at the local level. In the last category are some that could use volunteer help from the community; they include storm-drain stenciling (reminders not to dump paint or commercial liquids in street drains, which in both of our sub-watersheds lead to the streams), further research on the Eco District concept (already adopted by Georgia Tech), rain barrel promotion, and the search for space for a community garden (we’ve been looking for several years; any potential ideas are welcome). We are monitoring the City of Atlanta infrastructure bond initiative with a close eye toward improvements in our own neighborhood. So, of course, are many other communities. That process is underway, and we appreciate Councilmember Wan’s advocacy and efforts on our behalf. We’ll share what we know as this develops. Topics like the study of an Urban Design District need – and are getting – further study by the Planning Committee, a process spurred a bit by the recent wave of new construction that is pushing the legal limits on height and size. Some topics in the Master Plan are being addressed by other entities than VHCA, including the latest pedestrian improvements at SPARK. Pedestrian safety and improvements to help students get safely to school were a clear priority in the Master Plan. The new signal on Briarcliff Road has been installed and is now functional, with much credit going to Mary Stouffer, one of several Virginia-Highland residents involved in the Safe Routes to School program. We applaud the result (which we supported) and credit all the partners (including GDOT and the City) for their work. As you may have noticed, none of this happens – or will happen – quickly or without discussion. If you have questions or are interested in helping in a particular area, please contact us at planning@vahi.org. The Planning Committee meeting is public and you are welcome to attend. Meetings are held at the Church of Our Saviour (on N. Highland across from the fire station) and start at 7 PM on the Wednesday before the monthly Board meeting (dates posted on our vahi.org calendar). This month’s meeting is January 6th. February’s and March’s are on the 4th of each of those months. Click here to review the entire Virginia-Highland Master Plan. The Atlanta City Council unanimously approved the Virginia-Highland Master Plan at its Monday July 21 meeting. With the adoption, the plan becomes part of the City of Atlanta’s Comprehensive Development Plan. The VHCA thanks the many residents whose input shaped the plan’s contents and whose support ensured its adoption. Ideas and concepts included in the plan – from street toppers to bike lanes – need your continued input and support to become reality. Anyone interested in helping see these ideas take shape should contact board@vahi.org. Click here to view the final draft of the Virginia-Highland Master Plan as approved by City Council. After unanimous adoption by the VHCA board in April and overwhelming support at the NPU-F vote in May, the Virginia-Highland Master Plan will next be considered at the Atlanta City Council Community Development Committee meeting on Tuesday July 15, 2014 at 12:30 pm. The meeting will be held at City Hall in Committee Room #2. This meeting is open to the public. After review by the Community Development Committee, the Plan will be considered by the full City Council, most likely in August. Upon adoption by City Council, the Plan will then be added to the city’s official planning tool, the Comprehensive Development Plan (CDP). The City requires certain elements in a Master Plan: mobility, open space, recreation, safety, environmental issues, urban design, historic resources, public services, economic development, and education. All of these items were considered when assembling the VaHi Master Plan. Recommendations in the Plan also used as their starting point the existing plans and zoning code the City currently has adopted. 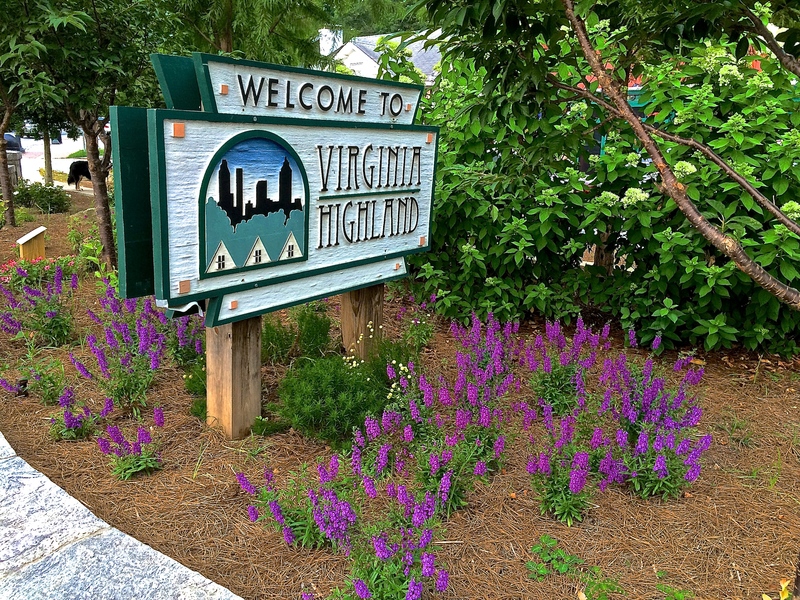 The Virginia-Highland Master Plan was overwhelmingly approved in a resident vote at the Monday May 19 meeting of NPU-F at the Hillside Center. The final tally was 72 votes for and 5 votes against. Adopted unanimously by the Virginia-Highland Civic Association Board of Directors at its April 17th meeting, the Plan will move next to the City Council Community Development Committee and then on to the full Council for adoption and inclusion in the City of Atlanta Comprehensive Development Plan. The Master Plan is the culmination of seven months of community outreach including a project website, continuous online input opportunities, public forums offered at various times of day and night, smaller focus group conversations, one-on-one conversations and a neighborhood steering committee. It provides a strategic vision in key areas like mobility, transportation, open space, recreation, safety, environmental issues, urban design, historic resources, public services, economic development and education. As a whole, the Plan will serve as a dynamic roadmap to guide future improvement projects in VaHi and will be a key document in securing funding from the City of Atlanta for such projects. A team of urban planners from Market+Main, led by Aaron Fortner, guided the VHCA and residents through the process of gathering public input, drafting and developing the Plan. The VHCA wants to thank those who attended Monday’s meeting and shared their thoughts on the Plan. Virginia-Highland residents care deeply about quality of life decisions made regarding their neighborhood, and that was never more evident than at last night’s meeting. 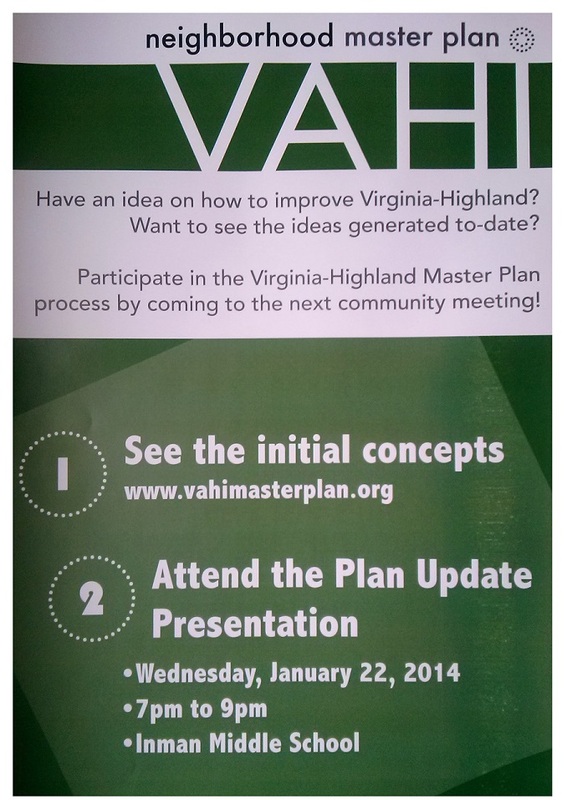 To learn more about and view a copy of the Plan, visit www.vahimasterplan.org. 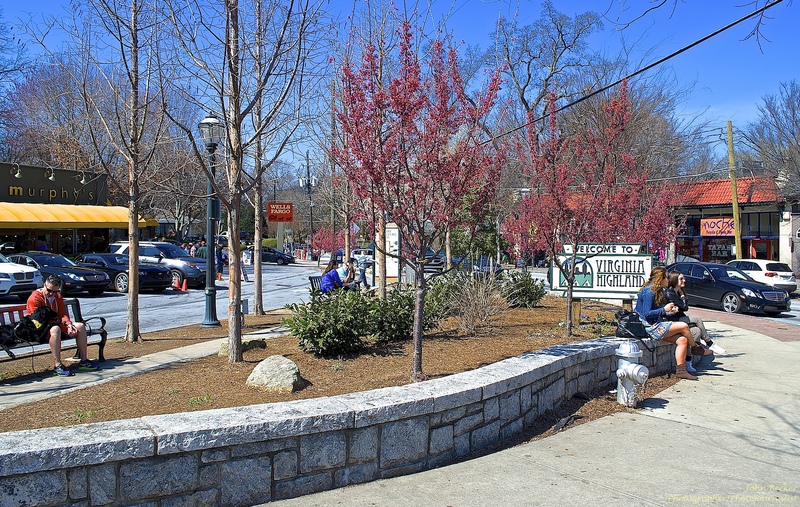 The Virginia-Highland Master Plan – unanimously adopted by the VHCA board on April 17 – will be an agenda item at the next NPU-F meeting, to be held Monday May 19 at 7 PM at the Hillside Center, 790 Courtenay Dr. (just off Monroe Dr. across from the entrance to Piedmont Park). The VHCA encourages VaHi residents to attend the meeting and participate in the process. Residents who live within the boundaries of NPU-F are eligible to vote on all NPU issues. Proof of residency is required for voting purposes – ideally a valid driver’s license indicating a home address within NPU-F boundaries. A recent utility bill in your name mailed to an address within NPU-F boundaries may be accepted. Access will be easier for those arriving early. Please allow some extra time – parking at the facility is limited. Our understanding is that the Master Plan will be early on the agenda, following presentations by local officials (which sometimes take a few minutes). For residents attending the meeting, please consider carpooling or walking if you can; parking may be a challenge. The Hillside facility sits between Courtenay and Monroe Drives. Access is available from 1301 Monroe, opposite the CSO facility and the entry to the Piedmont Park parking deck. Some parking is available at that Monroe entrance, but those spaces often fill up early. Another option is parking along Courtenay Dr., near its intersection with Amsterdam, 150 yards off Monroe. The back gate to the facility will be open to allow entry from that side. The Plan is a culmination of seven months of community outreach including online articles, VHCA newsletter articles, public postings, a project website, continuous online input opportunities, public forums offered at various times of day and night, smaller focus group conversations, one-on-one conversations and a neighborhood steering committee. The Plan provides the community with a strategic vision in key areas like mobility, transportation, open space, recreation, safety, environmental issues, urban design, historic resources, public services, economic development and education. As a whole, the Plan will serve as a dynamic roadmap to guide future improvement projects in VaHi, and will be a key document in securing funding from the City of Atlanta. A team of urban planners from Market+Main, led by Aaron Fortner, guided the VHCA and residents through the process of gathering public input, drafting and developing the Plan, which was unanimously approved by the VHCA board at its April 17 meeting. For more information and to view the Master Plan document, visit www.vahimasterplan.org. In response to a petition request from 50+ residents, the VHCA will host a Special Association Meeting on Tuesday, May 6 at 7 PM at the Virginia-Highland Church, 743 Virginia Ave. (opposite Inman Middle School). We will not be voting again on the Master Plan at this meeting, but – in response to the written request, properly made under VHCA bylaws – we will discuss why we decided to adopt the Plan at the April meeting and how this community has historically made such decisions. As part of the discussion, we will be happy to discuss the various ways citizens provided input to the Plan and how those comments were processed and are reflected in the Plan. Pursuant to Article II, Section 2.2 of the VHCA Bylaws, no business shall be transacted at this Special Meeting, except as stated in this Notice. 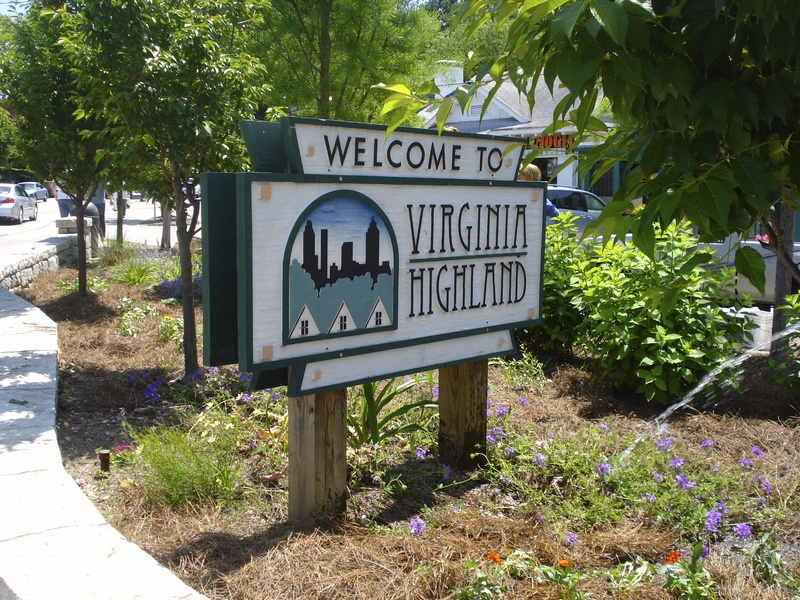 Editor’s Note: The Virginia-Highland Master Plan – as adopted by the VHCA board on April 14 – can be viewed here. Aaron Fortner, the Market & Main consultant who led the Master Plan study, characterized this neighborhood a few years ago as being “in danger of being loved to death.” His point was that our nearly ideal blend of home design, scale, small businesses, variety of residential options, and location had attracted so much attention and development pressure that maintaining the very features that distinguished VaHi could become a challenge. The rough model has been emulated throughout intown communities; our commercial aspects in particular now have real competition. The adoption of Neighborhood Commercial (‘NC’) districts along N. Highland Ave. was an early response to that. These three districts allow flexible parking approaches in exchange for building height limits of 42’. Defining these districts was inspired by a proposal to build a much taller building opposite the American Roadhouse; such a building might still occur in that one location. Such redevelopment – when it occurs – is very likely to follow the modern intown models of ground floor commercial topped by 2nd and 3rd-floor residential. As that occurs, there will be still more auto traffic on N. Highland. Even sooner, there will be more auto traffic from the re-development of Druid Hills Baptist Church just south of Ponce. We have mentioned several times this neighborhood’s historic and ongoing determination to maintain R-4 zoning along the BeltLine. That goal is important on its own merits, and also because there is the near-certainty of considerable new residential development along the BeltLine between Virginia and Ponce, behind the houses on Ponce Place. As that occurs, there will be much more auto traffic on Ponce Place, Virginia, and Monroe. We will never return to the old volumes or speed of driving in Virginia-Highland. We can all work to keep cars moving, but as new traffic arrives, we are going to move at slower speeds – out of necessity (those other cars) and, because of safety (respecting other legal users). Whether because of the traffic or in spite of it (or both), we now have many more citizens walking and biking. The importance of accommodating them safely and of keeping this neighborhood friendly to pedestrians were cited frequently during the Master Plan process. Keeping traffic moving is a goal we can all agree on, but it exists right beside the legal necessity of protecting other users. Except on specified roads like interstate highways, cyclists have a perfect right to be on the road. And they are exercising that right in ever-increasing numbers. They don’t need anyone’s permission to do so and they haven’t asked; they’re just showing up and riding. That group includes many of our own residents. That those cyclists are a numerical minority is irrelevant and does not alter their legal right to be safe or our need to accommodate them. Pedestrians – who every day include many residents of VaHi, some of them children – have a perfect right to cross the street in safety at marked crosswalks; cars have to stop for them and are more likely to do so when they are not speeding and the intersections are conspicuously marked. Any slight inconvenience that results to drivers from the slower speed is legally and morally secondary to protecting the rights of citizens to legally walk in our neighborhood. 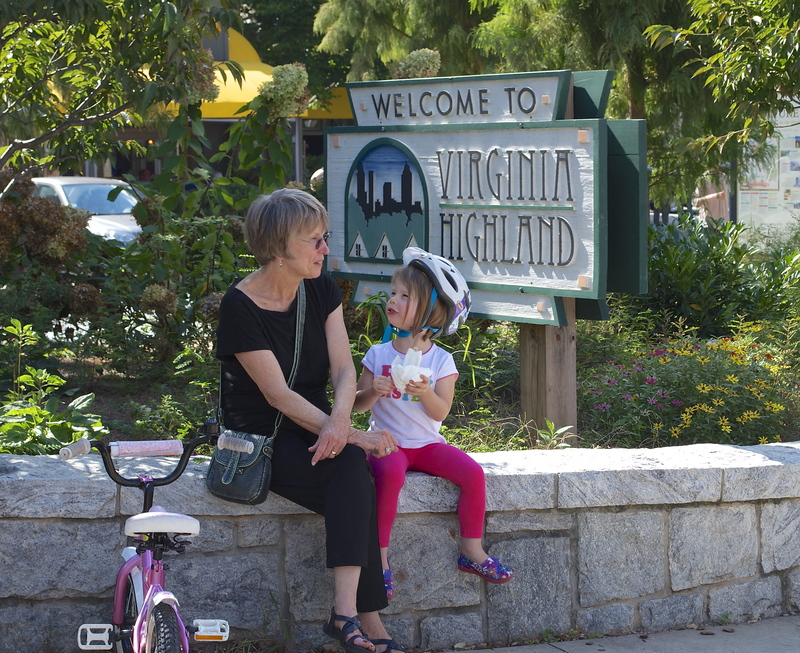 Living in a civil atmosphere with an active street-side lifestyle that safely accommodates and encourages usages other than autos is a key characteristic of Virginia-Highland, and we all benefit from it. Resident Comment: This plan supports those who walk and bicycle at the expense of those who drive. Virginia-Highland is the poster child for good intown living: a vibrant neighborhood with entertainment, restaurants, schools and park facilities. Residents have overwhelmingly said that safe, non-automotive ways of getting around are a distinguishing characteristic of this community that needs to be protected and enhanced. Being able to walk and bike safely were mentioned enough to cause the consultant to summarize the Plan’s entire theme under the rubric of ‘Healthy Living’. Resident Comment: Have other studies identified the importance of improving the safety of walking and biking? The independent consultants from Safe Routes to Schools have looked at the same challenges and made recommendations about pedestrian safety and access that are very similar to those in the Master Plan. For example, the Springdale Park plan focuses first on making Briarcliff Road safer; N. Highland and Ponce are the next priorities. Supported by the Springdale PTA, Poncey-Highland, and the Druid Hills Civic Association, the Springdale program is trying very hard to make pedestrian access safer, a particularly important topic for children and parents since APS school bus coverage has been reduced. The Inman Safe Route to Schools Program specifically noted accidents and concerns about pedestrian safety on Monroe Drive. Resident Comment: All these cars and delays make our neighborhood seem suburban. Nobody likes traffic, and we all may wish for less of it, but it doesn’t make us ‘suburban’. The most obvious difference between intown and suburban living is the intown concentration of retail, commercial, and entertainment options that can be accessed in non-motorized ways. Most of us are very dependent on our cars, but we typically use them much less than suburbanites because at least some of our recreational and daily shopping needs are close to home and are sometimes walkable and bikeable. Protecting those options was a frequent comment by residents in this process. VaHi residents have also been active advocates for walking and cycling over the last decade. This community has historically backed groups that champion these practices (PEDS, Atlanta Bicycle Campaign, the Atlanta Track Club) because they’re fun and healthy. Resident Comment: The Plan calls for painting sharrows (graphic of bicycles and arrows) on roads. Those give cyclists the right-of-way over cars. Sharrows are only a visual reminder that cyclists are on the road and that the law requires sharing – hence, the name. They are equivalent to a “Slow – children at play” sign – a reminder that other users may be present; they change no laws. Resident Comment: You can’t pass cyclists who are in bike lanes. Yes, you can. In fact, it’s easier to pass cyclists who are riding in a dedicated lane. Resident Comment: Bike lanes, sharrows, pedestrian signals, and bulb-outs are bad ideas. These are all tools, and like all tools, they are value-neutral, neither good nor evil. Not every cyclist wants or uses bike lanes; some take the motor vehicle lane. A poorly designed or marked bulb-out can be hazardous or irritating; at intersections where cars speed through turns, a bulb-out improves pedestrian safety by slowing the turn. One can find examples of both in northeast Atlanta. Resident Comment: Does the VHCA support the road diet piece of the Connect Atlanta Plan? The VHCA supports the outcomes that the CAP is designed to produce – a reduction in speed on Monroe, improvements in traffic flow (fewer cars stuck behind folks waiting to make left turns and making abrupt lane changes), better pedestrian conditions for crossing and walking along the road, and an improvement in the quality of life for residents on the road. Resident Comment: Even if we can’t change the Monroe Drive road diet, this plan goes too far. It takes away lanes from cars on other roads and gives them to cyclists. The Master Plan does not take lanes away from cars. Perhaps it should have; a number of people have said they thought it should. But it doesn’t. The road diet maintains 2 dedicated lanes – one in each direction – and a third shared lane for making left turns at any of the 17 opportunities to do so between Piedmont and 10th. In the short run, it proposes bike lanes in the remaining space; to be replaced when the BeltLine is extended by additional pedestrian components and plantings designed to shield walkers along Monroe from traffic. Resident Comment: If the Master Plan isn’t the mechanism for opposing the road diet, what is? Such plans are updated periodically, typically every few years. In our experience, City Planners will be glad to hear your arguments. They are usually quite capable of explaining their own rationales and data, and talking to them is certain to be enlightening, even if you disagree with them. Resident Comment: The road diet reduces auto capacity on Monroe. The City’s transportation planners don’t think it will. 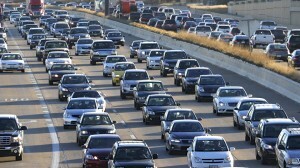 The most recent road counts for Monroe show traffic at about 18,000 cars a day. Resident Comment: How does that compare to traffic counts there 6-8 years ago? It is less, down from the low 20’s. 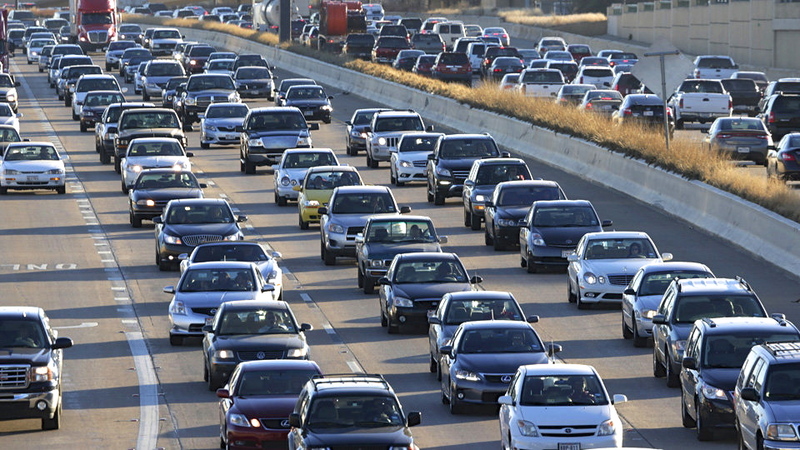 Many traffic counts have gone down nationwide. Oft-cited reasons for this trend include the recession, working from home, folks making conscious decisions to live closer to their work, and impatience with time spent on the roads incentivizing a search for better routes or methods. Resident Comment: Traffic levels on Monroe will go back up when Ponce City Market opens next year. Yes, they very well might, but the traffic models show that the road diet can handle 10-20% more cars than are currently using the roadway. Resident Comment: Every developer who proposes a huge new development provides a traffic study that shows everything will be fine. Skepticism is understandable and healthy, particularly when a party that stands to benefit financially from it is paying for such a study. Our consultants looked at it independent of the city’s examination and saw no obvious flaws. Any study can be erroneous, but those who have done the Monroe traffic models have no monetary motive in being inaccurate. Also, the road diet is already City policy and has been for several years. Resident Comment: The traffic signals on Monroe can be better programmed to handle more traffic. That would be great. We encourage sharing such ideas with the City traffic engineers. Perhaps there is a very simple fix that can be made somewhere on Monroe that will really help there – or maybe not. Either way, there’s no reason to delay trying, and we’d be glad to help arrange such a meeting, if that would be of assistance. Helpful or not, this single point has little to do with the Master Plan. Resident Comment: Why don’t you just leave out any reference to the road diet? That would be interpreted as being OK with it by default without having a big discussion. Deliberately NOT informing citizens about any law or process – or carefully not mentioning information because someone might not like it – is the exact opposite of good planning and totally inconsistent with this community’s historic approach, which has been based on openness. The iterative process is based on learning, asking, and discussing. That process takes time and has real value; a better-informed citizenry is one of the benefits of those who go through it. It is interesting to note that our process appears to have informed many more citizens about the road diet than the city did on either of the two occasions it passed the plans that included the feature. By the way, how exactly would anyone responsibly involved in the Master Plan process reply to a resident who asked if important content had been omitted because it might upset someone? Resident Comment: Are there parts of the Connect Atlanta Plan that the VHCA does not like? Inevitably, there are – specifically the concept of a new road though the Ponce de Leon Kroger from North Avenue to Ponce de Leon Place. We are very concerned that such a connection would funnel what we fear would be new large volumes of traffic from North Ave. (especially once Ponce City Market opens) into our neighborhood. Resident Comment: Why isn’t that opposition part of the Master Plan? Master plans start with and are based on existing policies and do not assume that that they will change. No individual or group waives their right to try to change polices in the future by learning and acknowledging what existing policy is. Resident Comment: Why didn’t the Master Plan seek to prohibit retail chain stores? As with the road diet, the Master Plan approached commercial topics through existing law and policy. Even if the commercial areas in VaHi were prospering, and even if city code contained a definition of what a chain store is (which is not as straightforward as it may seem), there is no basis in law for limiting them. While the VHCA is a resident-based organization, the health of the commercial districts received a a good bit of focus in the Plan. Some proposals will have to await the expiration of or changes to the Park Atlanta contract (because that is law and no matter how much we wish we could change it with a master plan, we cannot), but there are some specific infrastructure recommendations for the Atkins Park NC district that are intended to improve the street-side atmosphere and make the area more attractive. Resident Comment: Why didn’t the Steering Committee and the Board participate in the social media debates? They did. Members of those groups made approximately fifty comments on various social media sites, providing a large amount of input on issues, process, and schedules. We also commented to ensure that resident concerns and comments were directed to the proper channels (www.vahimasterplan.org and specific board members) where they could be observed and recorded. Resident Comment: No neighborhood votes are needed on one-foot variances; they’re not very important. But we should vote on the Master Plan, like Candler Park did. Candler Park followed its by-laws and rules, as it should have. They vote neighborhood-wide on all requests: one-inch variances, one-foot variances, two-foot variances, and any and every other detail. Virginia-Highland has very successfully used a representative model to engage on a wide and sophisticated range of processes (including running a very successful Tour of Homes and Summerfest that raise large amounts of money that is spent on – among other things – schools, parks, planning, and sidewalks. We followed our by-laws throughout this process, as we should have. It is worth noting that the distinction cited – variance review versus formal planning – is not nearly as broad as it might seem. While some variance requests are routine, others are not and their content and the manner in which they are handled have a great deal more neighborhood-wide significance than might be obvious at a glance. Resident Comment: The Board’s support of the Master Plan was pre-ordained; there are Board members on the Steering Committee who weren’t impartial. We certainly were not impartial on the value of a Master Plan, or we would not have studied them, gone to other neighborhoods that were meeting on the topic, talked to the City of Atlanta’s Planning Office, sought out the opinion of several city council members, or asked two of them for financial support to defray the cost of developing the Plan. No citizen – certainly not any board member or volunteer on a master plan – starts with a tabula rasa, a blank slate. But there were no pre-ordained conclusions about any specific content, where input arrived from a variety of sources – residents, the consultants, and other planners. The VHCA thanks the many residents who have engaged in the Master Plan process, providing valuable insight into current experiences in VaHi and goals for the future of our neighborhood. Please reach out to board@vahi.org for further information and continue to comment on the plan at www.vahimasterplan.org. Editor’s Note: Jett Marks is a Virginia-Highland resident and non-VHCA board member who serves on the Master Plan Steering Committee. Since October of this past year, Virginia-Highland residents have been enthusiastically participating in a blueprint for our future, a Master Plan that defines not only who we are, but what we want to become. At the April meeting, the Virginia-Highland Civic Association formally adopted a Master Plan that reflects how we view ourselves, what we value, and – as a practical matter – specific recommendations to build for our community’s future. The process started with an on-line survey. The survey guided us to share what we love about our neighborhood, what we wanted to keep, and also what needed improvement. By listening to what Virginia-Highland residents value, the planning team could establish what it was capable of becoming. Through focus groups and public forums, the team of urban planners from Market + Main, led by Aaron Fortner, guided us through the process. The City requires certain elements in a Master Plan: mobility, open space, recreation, safety, environmental issues, urban design, historic resources, public services, economic development, and education. Assembly of the Master Plan incorporated input for all of these elements. The City’s existing plans and zoning code provided the starting point for the neighborhood’s planning. For decades, Virginia-Highland has represented a lifestyle other Atlanta neighborhoods have desired to embody, but what exactly were they trying to embody? What is the essence of Virginia-Highland? The planning process sought out this essence. Across the many responses that came in, there were numerous threads: walkability, the human-scaled streets, the green spaces, the “street-car pattern” that shaped the ratios and placement of commercial, residential and rental, the old and new, the urban and retro-suburban, the outdoorsy / active / running / dog-walking / front-porch living, the funky / edgy, and some history too — the VHCA got its start by swimming against the stream of white-flight while challenging the construction of an interstate highway. Basically, we’re a bunch of non-conformists, but happy ones. Out of many threads, we did find one. Healthy Living is the unifying pattern in the complex tapestry that reflects our community. The process was guided by a Steering Committee whose role was first to listen, then to help all the non-conformists get along. There has been a healthy amount of conflict resolution. An early conflict was the initial recommendation to include bike lanes on N. Highland to accommodate the growing cycling population. After meeting with the business community and the residents who depend on on-street parking, the recommendations were adjusted to balance between the loss of on-street spaces and providing for the safe travel from the BeltLine into our business nodes. Many recommendations did not survive a review of immediate challenges and concerns voiced by City of Atlanta Planners whose input was carefully considered. Whereas the larger set of recommendations may not all work at this time, the plan captures those valuable discussions and they can still be considered for future approaches to problems we will continue to address. The plan – befitting a thriving community – will evolve. And that’s healthy too. The Virginia-Highland Civic Association voted unanimously at its Monday night meeting to adopt the Master Plan as currently posted on www.vahimasterplan.org. Click here to view a video of the board meeting in its entirety. The Plan is a culmination of seven months of community outreach including a project website, continuous online input opportunities, public forums offered at various times of day and night, smaller focus group conversations, one-on-one conversations and a neighborhood steering committee. The Plan provides the community with a strategic vision in key areas like mobility, transportation, open space, recreation, safety, environmental issues, urban design, historic resources, public services, economic development and education. As a whole, the Plan will serve as a dynamic roadmap to guide future improvement projects in VaHi, and will be a key document in securing funding from the City of Atlanta. The Plan will next be presented at the NPU-F meeting to be held Monday, May 19, at 7 PM at Hillside School, 690 Courtenay Drive. Interested residents are invited to attend. On June 9 the Plan will be presented to the City Council Community Development Committee. On June 16th the full City Council will consider and vote on adopting the Plan as a recognized document by the City of Atlanta and incorporating it into the City Comprehensive Plan. A group of residents has requested a special meeting of the VHCA to discuss issues related to the Master Plan. The VHCA intends to convene such a meeting at a TBD time and place. Details of the meeting will be announced as soon as they are available. The VHCA would like to thank the Master Plan Steering Committee (see member list below) for the many hours of hard work they invested in working with Market+Main and residents to develop the Plan; Market+Main for their invaluable assistance in guiding the neighborhood through the process; and most importantly, the residents of VaHi who stepped up and took advantage of the many opportunities to provide valuable input into the creation of the Plan. We are a community of residents who care passionately about their neighborhood, and this project has been a true reflection of that reality. The VHCA will have adoption of the Master Plan on its meeting agenda this Monday April 14. The meeting will be held at the Ponce de Leon Ave. library meeting room at 7 PM. The board will discuss the plan and very likely consider a motion regarding sending the Plan on to the next steps toward formal adoption. The meeting is open to the public and interested parties are encouraged to attend. As we wrap up the process, it’s worth a look back at what the goals of the process were. The Master Plan was undertaken for several reasons. Part of the reasoning was to give this community (and its various sub-neighborhoods) a better voice in decisions regarding allocations of funding resources that may become available if a bond proposal anticipated for next year is approved. A second reason was to involve citizens in a more conscious and deliberative way in thinking about the interrelated challenges – large and small – that we face in urban design, the environment, development, aesthetics, transportation, planning, parks, schools, and other issues. Decisions in such areas are made continually by local and regional planning agencies, often with very little neighborhood input. The Master Plan was designed as an interactive approach that aspired to both inform citizens about many existing (and overlapping) polices and processes and then invite them to weigh in and suggest new outcomes. Many months and revisions later, a plan exists that reflects dozens of ideas and arguments (broad and specific) voiced by a wide variety of citizens. Iterative processes sometimes produce surprising outcomes; this one has had its share. Consensus and broad support was achieved in many areas, but not in all areas. That, too, should not be a surprise; a community with the width and breadth of ideas found in Virginia-Highland will occasionally disagree. One part that all citizens might agree on is this: while community-based master plans have both direct and indirect value, they do not have the weight of law. Whatever values you support and whatever visions you have for this neighborhood – and however many times you voiced them during this process – this plan is not an end in itself. All current public processes and decision-making opportunities will continue to operate and will need our ongoing participation. The inclusion or exclusion of a concept in a master plan has little value if its supporters do not continue to advocate for it (or against it, as preferred). In the course of discussing the plan and in other ongoing contexts – the approaching expansion of Inman Middle School, development along Highland, and residents on Monroe – it has been a pleasure to meet and review these issues with many, many citizens. Without exception, they have all been courteous, inquisitive, concerned about the neighborhood, thoughtful, and attentive. This specifically includes a number of people who disagreed – sometimes very strongly and very articulately – with some parts of the plan or of city polices that they learned of during the process. If a secondary by-product of this plan is involving new volunteers in committee and association activities, then that may be the best outcome of all. Most VHCA work is done at the committee level. Three new board members this year came from a background of other association projects; there is always an opportunity to be involved, and there is no better way to be effective than by being informed, and no better way to be informed and impactful than being involved. We invite and welcome your participation. The Virginia-Highland Civic Association (VHCA) is pleased to announce that, after six months of community input, the initial draft of the Virginia-Highland Master Plan is available. Click here to review the Plan draft. The VHCA will host an Open House on Sunday, March 23rd from 2:30 – 4:30 at the old Aurora Coffee location on N. Highland near Virginia (across from Yeah Burger) to answer questions from residents about the Plan. Background (pgs. 5 – 32) Includes neighborhood demographics and summaries of other City Plans, including the North Highland Avenue Study, the Ponce-Moreland LCI Study, the Beltline Subarea 6 Master Plan, the City of Atlanta Comprehensive Development Plan, and the Connect Atlanta Plan. All of these plans have sections that address areas in VaHi and all have already been adopted by City Council. Neighborhood Engagement (pgs. 49 – 79) Includes detailed information on all comments that were received via the Master Plan website, the public meetings and focus groups. Neighborhood Vision (pgs. 95 – 142) Contains the Plan’s proposed projects/proposals for VaHi. These are the proposals that came out of the six-month public input process leading up to the Draft Plan. Aaron Fortner, the professional planning consultant who prepared the Master Plan, gave an excellent presentation on the Plan at the March 10th VHCA board meeting. Here is a link to a three-video YouTube playlist of Aaron’s presentation: http://www.youtube.com/playlist?list=PLZ8Bju7IpCXqaf5HLSElch68uzQaTmbxy. Following are start/stop times for key portions of his presentation. Aaron’s Entire Presentation Including Q/A: This excerpt starts at 15:43 of Part 1 and ends at 16:18 of Part 3. Aaron’s Monroe Dr. Presentation: This excerpt starts at 33:48 of Part 1 and ends at 41:05 of Part 1. Aaron’s Accessory Dwelling Presentation: This excerpt starts at 54:11 of Part 1 and ends at 58:07 of Part 1. The Q/A Session Only: This excerpt starts at 10:23 of Part 2 and ends at 16:18 of Part 3. If you have questions specifically about the Monroe Dr. Road Diet, the excerpt of Aaron’s presentation on Monroe is available at the following link: http://www.youtube.com/watch?v=L8vga9fvBWI. At 140+ pages, the document provides detailed information on all the public input that has been received over the past six months. As with all other phases of the Master Plan process, residents and business owners will continue to have an opportunity to provide input on the Plan through the Master Plan website. We encourage everyone to submit comments on what they like and don’t like about the draft Plan on the “Feedback” page of the Master Plan website: http://www.vahimasterplan.org/master-plan-first-draft.html. A revised draft of the Plan reflecting the input received through the Website and at the Open House will be posted on April 4. 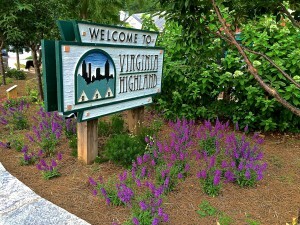 The Virginia-Highland Civic Association (VHCA) is pleased to announce that, after six months of community input, the initial draft of the Virginia-Highland Master Plan is being released today on the Master Plan website: http://www.vahimasterplan.org/. At 140+ pages, the document provides detailed information on all the public input that has been received over the past six months. As with all other phases of the Master Plan process, residents and business owners will continue to have an opportunity to provide input on the Plan through the Master Plan website. There seems to be confusion among some residents about how the VaHi Master Plan has been developed and drafted. Some people assume that the VHCA Board has drafted the Plan. That assumption, however, is incorrect. The Plan was not drafted by the VHCA, and the VHCA has in no way dictated the Plan’s content. To develop the Plan, the VHCA hired Aaron Fortner of Market + Main. Aaron is a former City Planner and has served as the Planning Committee’s consultant on zoning and municipal issues for many years. He has led the Master Plan processes for a number of neighborhoods, including Edgewood, Brookwood Hills and Candler Park. To read Aaron’s biography, visit http://www.marketandmain.net/aaron.html. Phase 1: A Master Plan website was developed to allow residents to review concepts and provide input 24 hours a day. The first phase of the website had a Survey and an Interactive Map where people could identify what they like most (and least) about VaHi. The Interactive Map allowed people to make specific comments about specific locations in the neighborhood. Phase 2: Input from the Survey and Interactive Map was used to develop some Preliminary Planning Concepts for the neighborhood. The Preliminary Concepts were presented at a public meeting and all-day design charette where people had an opportunity to talk to Aaron and his team and provide in-person input on the Preliminary Concepts. The Preliminary Concepts were also presented on the Master Plan website so residents could provide input and comment on the Preliminary Concepts via the website as well. Phase 3: The Preliminary Concepts were modified based on the comments in Phase 2 and refined into some Proposed Concepts. The Preliminary Concepts were presented at a January 22 public meeting and again on the website. As in Phase 2, people had an opportunity to provide input both in person and on-line on the Preliminary Concepts. Phase 4: The Proposed Concepts were again modified based on public input and used to develop the initial draft of the Master Plan. This draft of the Master Plan will be presented at the Virginia-Highland Civic Association Board meeting on Monday, March 10th. As with all stages of this process, people will continue to have an opportunity to provide comments on the concepts in the Plan. The draft plan concepts will continue to be modified based on public input until the Final Master Plan is published. In addition to the four phases noted above, five focus groups – consisting of residents and business owners in VaHi – were conducted throughout this process to obtain input on specific issues. Aaron and his team also met with officials of the City of Atlanta’s Planning Department to provide updates on the Plan and discuss the feasibility of the concepts that were evolving from the public input process. In order to fully understand the process, it is helpful to look at a couple of small-scale examples of specific concepts and how they evolved during the Plan development process. In Phase 1, residents of Cooledge, and several other streets, indicated that they would like to reduce cut-through traffic and speeding on their street. In Phase 2, “bulb outs” were proposed for several streets that expressed these concerns, including Cooledge. During the public input part of Phase 2, the residents of that street almost unanimously indicated they did not want bulb-outs on Cooledge, deciding that they were inconsistent with the historic character of their brick street. Residents of other streets, however, embraced bulb-outs and other traffic calming measures for their specific streets. In Phase 3, based on the input provided in Phase 2, bulb-outs were part of the Preliminary Concepts for some streets, but were no longer proposed for Cooledge. Also, bike lanes on North Highland Avenue were proposed and considered in the opening stages. Based on an array of public comments – many supportive – and identified challenges, the Draft Master Plan does not recommend bike lanes for North Highland. Where varying and multiple shades of opinions were expressed – which is in a number of areas – Aaron’s team looked first for overall impacts on the community, the goals and reasoning used in existing plans (where they applied – the city’s Connect Atlanta Transpiration Plan is such an example) and offered its best judgment of how to proceed for each subject. In some cases – changing the code to allow accessory residential structures or design guidelines, for example – the plan recommends further study of the topic and monitoring the City’s anticipated revisions. All transportation recommendations are based on existing municipal and state laws and standards, and none conflict with city policy; many ideas reflect insights gleaned from city staff about the municipality’s evolving approaches on many topics. As with other phases of this process, there will be ongoing opportunities to provide input, including 24 hours a day at the Master Plan website. Our residents and neighbors have made an extraordinary number of suggestions on both broad and specific topics, and Aaron and his team have expended a huge amount of work trying to filter and synthesize everyone’s comments and aspirations for this community. Many diverse ideas have been expressed, but there are a significant number of well-identified challenges and strongly expressed wishes. I hope everyone will review all the draft’s concepts and recommendations and provide specific comments through the website. For the past six months, Virginia-Highland residents have provided tremendous insight into the creation of the neighborhood’s first Master Plan. An initial draft of the Master Plan will be presented at tonight’s regular monthly VHCA board/general meeting. Again, this is a presentation of the Plan’s initial draft – there will still be ample time to review, reflect and comment on the Plan in the weeks to come. The initial draft of the Plan should be available for review sometime this afternoon at http://www.vahimasterplan.org/. The meeting will be held in the downstairs meeting area of the Virginia-Highland Church located at 743 Virginia Ave. (across from Inman Middle School). The meeting will start at 7 PM with regular business expected to take 30-45 minutes, after which the Master Plan presentation will begin. Residents are invited to attend the full meeting, or come only for the Master Plan portion. There will be an opportunity for residents to ask questions about the Plan. Click here to read an article from VHCA board member and Master Plan steering committee co-chair Jenifer Keenan that provides valuable insight into the process of creating a Master Plan for our neighborhood. As the process to create a Master Plan for Virginia-Highland enters its sixth month, we want to say just one thing – Thank You! Participation in January’s public meeting was collaborative, engaged, and produced a wealth of feedback for our planners at Market+Main. Concepts presented and discussed at January’s public meeting are currently available on the Master Plan website (link below). If you were unable to attend the meeting, you can find a video of Aaron Fortner’s presentation on the website which explains the concepts, their context, and origins. Please review the concepts available on the website and be sure to submit your feedback: http://www.vahimasterplan.org/. The first draft of the Master Plan will be posted on the Master Plan website on March 10th. As with every step in the process, the public is highly encouraged to comment on this first draft. Submitting your feedback to the draft online is going to be the most effective way for the planning team to hear from you. As comments are submitted on the websiteand subsequent edits are made, the document will continue to evolve to best fit the neighborhood. We anticipate a revised draft to be posted on or around April 4th. The Virginia-Highland Civic Association board will vote on the Master Plan document in April or May; ultimately the document will go to Atlanta City Council for adoption. The process began with public input and continues to rely on peoples’ first hand experiences to pinpoint issues and opportunities in Virginia-Highland. As the document takes shape, please continue this wonderful trend and, again, thank you all for your participation, excitement, and support! Please visit http://www.vahimasterplan.org/ to submit your comments. Continue reading for additional background on the Master Plan process. Planning consultants Market+Main lead the Master Plan process alongside a volunteer steering committee of residents from a variety of backgrounds. The process has three broad and overlapping parts: discovery, design, and documentation. We are now in the documentation phase, with an end result of a final Master Plan document voted on by Atlanta City Council to guide future project and funding decisions. The Master Plan will be a key document in securing funding from the City of Atlanta for neighborhood improvements and projects. As part of the City of Atlanta, Virginia-Highland’s transportation infrastructure, economic development, zoning laws, urban design, education options and environmental regulations are shaped by that municipality, as well as by Fulton County and the state. New construction also shapes our neighborhood and its character. Having a Virginia-Highland Master Plan provides a formal avenue for citizen and neighborhood goals to be identified and clearly expressed. Additionally, the Master Plan will knit together elements from existing and sometimes overlapping plans and policies that already address parts of Virginia-Highland. Currently, parts of the Connect Atlanta Plan, the Atlanta BeltLine Overlay District regulations, Cycle Atlanta: Phase 1.0, and the Ponce de Leon Corridor Plan all contain plans for parts of Virginia-Highland. Understanding these plans is a considerable task and becomes an even greater challenge when considering the likely impacts of future development that existing zoning already assumes. The neighborhood can engage in those initiatives to shape them to our mutual benefit, or alternatively wait for changes and new projects to move forward without Virginia-Highland input. Creating this Master Plan provides an opportunity to be involved in initiatives that the City has already begun – some of them well underway. It also gives the neighborhood a platform on which to prepare for future projects, including those that may be contemplated in next year’s anticipated bond referendum. Changes are inevitable; this is a grand chance to inform and shape these changes. The final community workshop for the Virginia-Highland Master will be held January 22nd at Inman Middle School from 7:00 – 9:00 pm. This will be your best chance to provide in-person input into the Master Plan and ask questions of the planning consultants before the plan is drafted. During the workshop, our neighborhood planning consultants will provide an update on where the 6-month community input process stands and facilitate a community-wide discussion on the topics that will be addressed in the plan. Topics include land use and zoning, transportation, open space and environment, urban design, historic resources, public services, economic development, and education for the community. Breakout stations will enable you to provide input to our professional planners on what you would like to see in our neighborhood in the years to come. Don’t miss your chance to hear about the plan in person and provide input on your priorities and vision for VaHi! The Virginia-Highland Master Plan is a comprehensive community planning and visioning process initiated by the Virginia Highland Civic Association for the purposes of establishing a compelling vision for the future of this vibrant Atlanta neighborhood. This 6-month process will leverage community input to generate a strategic plan for land use and zoning, transportation, open space and environment, urban design, historic resources, public services, economic development and education for the community. It will be a key document in securing project funding in the future. Please visit vahimasterplan.org for more details or contact Jess Windham and Jenifer Keenan at jlwindham@gmail.com. Since the Master Plan process began in August, there’s been a great deal of conversation about what makes Virginia-Highland a great place to live. It’s the Master Plan’s goal to capture neighborhood consensus on those features that make the neighborhood such a successful and vibrant community and to outline a path for continued success. The Master Plan will be a key document in securing funding from the City of Atlanta for neighborhood improvements and projects. As part of the City of Atlanta, Virginia-Highland’s transportation infrastructure, economic development, zoning laws, urban design, education options and environmental regulations are shaped by that municipality, as well as by Fulton County and the state. Having a Virginia-Highland Master Plan provides a formal avenue for citizen and neighborhood goals to be identified and clearly expressed. Creating this Master Plan provides an opportunity to be involved in initiatives that the City has already begun – some of them well underway. It also gives the neighborhood a platform on which to prepare for future projects, including those that may be contemplated in next year’s anticipated bond referendum. Changes are inevitable; this is a grand chance to inform and shape these changes. The choice broadly is to sit back and wait, or try to use these opportunities to identify and meet the neighborhood’s needs. Planning consultants Market + Main lead the Master Plan process alongside a volunteer steering committee of residents from a variety of backgrounds. The process has three broad and overlapping parts: discovery, design, and documentation. While we still have a long way to go, the end result will be a final Master Plan document voted on by Atlanta City Council around April 2014 to help guide future project and funding decisions. The discovery phase has been extensive, and it continues as Market + Main begins to create design options based on existing input. During the first two months of the process, a Master Plan online survey and interactive map were available 24 hours a day so people could provide input for the master plan, whether at 2 PM or 2 AM. It gathered over 150 comments each to both the survey and map comments. In addition, an all-day and evening design charrette was hosted to get ideas and have discussions in person. Also, in the last two months we have hosted volunteer focus groups and will continue to do so through January. All of this has been done with the intent of ensuring that everyone who wants to provide input has ample opportunity to do so over the many months that this process is ongoing. Using these discussions and various avenues for feedback, Market + Main has shaped some preliminary concepts for the Virginia-Highland Master Plan that are now available for comment. Preliminary concepts will be available for comment on the website now through January 3, 2014. A public meeting in late January will further explore these concepts, incorporating feedback from the website, and continuing to leverage community involvement to shape the Master Plan document. Check out the preliminary concepts and comment at http://www.vahimasterplan.org/preliminary-concepts.html. Click here to view a video of Market + Main’s evening presentation at the design charrette. The Master Plan is sponsored by the Virginia-Highland Civic Association. Updates are provided monthly at the scheduled VHCA board meetings, as well as at vahi.org and in The Voice e-newsletter. The Virginia-Highland Master Plan community design charrette is coming up, and we want to see you there! All day Tuesday, November 12th, the Market + Main team of planners and designers will be hosting this design charrette (aka workshop) for the Virginia-Highland Master Plan. Stop in at Virginia-Highland Church across from Inman Middle School between 7:30am and 5pm to contribute your ideas, see the results of the online map and survey, share your VaHi experience, and be a part of the process by interacting with the planning team. At 7pm on the 12th, the Market + Main planning consultants will conduct a community meeting at the church where they will present the ideas and concepts that have been generated to address the issues and opportunities expressed by the community. These emerging concepts will include ideas for addressing traffic calming, pedestrian mobility, biking, future land uses and open space enhancements. Before the community design charrette, be sure to participate in the online survey (http://www.vahimasterplan.org/survey.html) and put pins in the online interactive map (http://vhmp-civicworks.dotcloud.com/#page/about) so that the Market + Main team can know your ideas and concerns heading into the November 12 charrette. The survey and interactive map will only remain active through Friday November 8 so please submit your experience, ideas, feedback, gripes, loves, and all before then! For more background and information about the Virginia-Highland Master Plan process, please visit http://www.vahimasterplan.org/. The Virginia-Highland Master Plan community design charrette is tomorrow Tuesday, November 12th, and we want to see you there! All day Tuesday, November 12th, the Market + Main team of planners and designers will host a design charrette (aka workshop) for the Virginia-Highland Master Plan. Stop in at Virginia-Highland Church across from Inman Middle School between 7:30 AM and 5 PM to contribute your ideas, see the results of the online map and survey, share your VaHi experience, and be a part of the process by interacting with the planning team. Then, at 7pm on the 12th, the Market + Main planning consultants will conduct a community meeting at the church where they will present the ideas and concepts that have been generated to address the issues and opportunities expressed by the community. These emerging concepts will include ideas for addressing traffic calming, pedestrian mobility, biking, future land uses and open space enhancements. As detailed over the last few months, a Master Plan for Virginia-Highland is being developed to address a wide range of issues in our neighborhood – from traffic and parking, to historic preservation, and everything in between. In order to make the Plan a success, and reflect the hopes and wants of the neighborhood, we’d like to know all about your neighborhood experiences. One of the most visible and active tools in the Master Planning process is the website (www.vahimasterplan.org) and its accompanying tool box of features that will gather input directly from you and enable people with all kinds of schedules to participate. From today through Friday November 8th, you can share your experiences, opinions, and unique perspective on Virginia-Highland through a brief online survey: http://www.vahimasterplan.org/survey.html. Having your feedback will be key to shaping the questions to be addressed in the Master Plan. What do you think are the most important issues that will be facing Virginia-Highland in the next five years? How would you rate parking or the cost of housing? At the bottom of the survey, you’ll find another tool we are excited about: an online map where you can pinpoint and note exactly what you have observed, love, hate, or want improved in Virginia-Highland. You can add your input directly to the map at http://vhmp-civicworks.dotcloud.com/. The map will allow you to place a “dot” on a specific area on the map and add comments tied to that map location. This will enable the community to address specific issues – like whether a stop sign is needed for a particular intersection – to more general issues, like the impact of large events and festivals on our community. For all you Instagram fans, send us pictures of what you love (or hate!) about Virginia-Highland to @VaHi_ATL with the hashtag #welovevahi. Be sure to follow us on Twitter for the latest updates and reminders for events. On top of feedback from all of these tools – the website, survey, interactive map, and social media – we will also be holding focus groups on specific topics, a Design Workshop, and a Plan Presentation in the coming months. The Design Workshop and Plan Presentation will be open to the public. Details on dates, times and locations will be announced soon. Efforts to create a Master Plan for Virginia-Highland are well underway, and we want to know all about your neighborhood experiences. One of the most visible and active tools in the Master Planning process will be the Master Plan website and its accompanying tool box of features that will gather input directly from you and enable people with all kinds of schedules to participate. We’re still putting the finishing touches on the website and our current plan is to officially launch the site on Monday, October 7th. The few entries that have already been submitted will be recorded, but we ask that people wait until the official launch on Monday to respond to the survey and submit comments. Starting Monday, you’ll be able to share your experiences, opinions, and unique perspective on Virginia-Highland through a brief online survey. Having your feedback will be key to shaping the questions to be addressed in the Master Plan. What do you think is the most important issue facing Virginia-Highland in the next 5 years? How would you rate parking or the cost of housing? At the bottom of the survey, you’ll find another tool we are excited about: an online map where you can pinpoint and note exactly what you have observed, love, hate, or want improved in Virginia-Highland. You will be able to add input directly to the map. On top of feedback gathered through the website, survey, interactive map, and social media, we will also be holding focus groups and a Design Workshop in the coming months. Dates and locations will be announced soon. Keep an eye out for our official launch announcement on Monday. In July of this year, the Virginia-Highland Civic Association announced the formation of a Task Force to guide the creation of a transportation plan for Virginia-Highland. This plan contemplated combining public input and review of existing factors with professional planning guidance to create an effective set of goals based on an overall vision. We asked for volunteers; the number of citizens who responded represented an impressive cross-section of VaHi residents. As we tried to define the scope of such a plan, many closely related topics emerged that are fundamental to the community’s future, though not directly related to transportation. In order to make the most efficient use of the feedback processes and resources needed for any such public effort, it became clear to the Board that it makes more sense to broaden the planning scope beyond transportation to key topics like open space, urban design characteristics, historic resources, public services, demographic issues, development variables, environmental challenges, and educational concerns. The result will be a Master Plan for Virginia-Highland. The advantages of a formal master plan are considerable. One is obvious: it’s a formal chance for citizens to examine alternatives and create goals in the context of existing development plans, policy and research. Visions that are formed absent such contexts have very limited chances of being implemented. Additionally, most governments – including the City of Atlanta – are far more likely to approve and fund projects that are broadly consistent with their own approaches and have been formally adopted through a recognized master plan process. Once just a very good idea, community-based master plans are now a practical necessity in large urban areas. Neighborhoods that have such plans are far better situated than those that do not. Our neighbors in Poncey-Highland and Candler Park have recently completed master plans; they may be viewed at http://www.atlantaga.gov/index.aspx?page=767 and http://www.candlerparkmasterplan.com, respectively. The timeline and method for creating this plan is approximately 8 to 12 months, with public engagement and meetings throughout the process. The process will be led by our longtime planning consultant and partner, Market +Main, under the guidance of Aaron Fortner, who played such a key role in the adoption of the Neighborhood Commercial Zoning along North Highland Avenue. There will be many opportunities to contribute to this effort, and we would like to hear from you. Please keep an eye out for announcements throughout the fall season for public engagement, both in-person and online. Throughout the process, we will be compiling information on this website: http://www.vahimasterplan.org/. While no requirement other than residency is needed to be part of this process, you can let us know if you are particularly interested in serving on a focus group by providing this form to Jenifer Keenan at jkeenanvahi@yahoo.com by Sept. 9. Why are you interested in serving on the Focus Group? What expertise/experience do you have in the area that will be covered by the Focus Group?